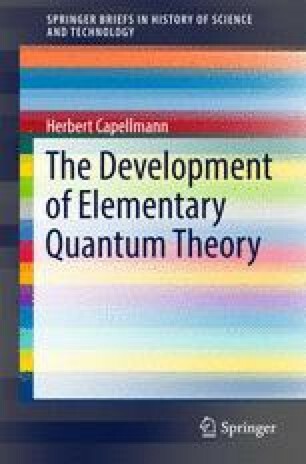 The scientific development of elementary Quantum Theory will be described, relying on original publications of the major contributors and letters during the same period of time. Recollections from later times are omitted intentionally. Years or decades past have the inevitable tendency to blur and often embellish the glorious past; it is attempted to avoid these effects. The main emphasis will be on physical concepts and ideas; mathematical formulae will be kept to a strict minimum, essential for the understanding. It will be stressed that mathematical representations are interchangeable, the physical content may be described in many different ways.